Stephen Roberts ed. Annotated Bibliography Of Chartism, 1995-2018 is now available from Amazon, priced £7.99. Casie Legette Remaking Romanticism: The Radical Politics of the Excerpt is now out. This is a study based on Chartist journals. Greg Vargo An Underground History of Early Victorian Fiction: Chartism, Radical Print Culture and the Social Problem Novel is due later this year. Rob Breton The Oppositional Aesthetics of Chartist Fiction is now out. Michael J. Turner, Radicalism and Reputation: The Career of Bronterre O'Brien is out in April 2017. Catherine Howe - author of Halifax 1842 - has written an essay about the relationship between the Chartist leader Feargus O'Connor and the actress Louisa Nesbitt. You can read it here. J. Briggs, Novelty Fair: British Visual Culture Between Chartism and the Great Exhibition is now out from Manchester University Press. A new short biography of the Chartist-poet Thomas Cooper has just been released. Thomas Cooper: 'A Very Giant of a Man' by Linda Crust is published by CRB Associates 9 Church Lane, Potterhanworth, Lincoln LN4 2DP. E: info@crbtypesetting.co.uk. Sadly, as the book was going to press, Linda Crust sustained injuries in an accident from which she never recovered. M.J. Carter The Printer's Coffin is a whodunnit set in London in 1841. Blake & Avery set out to find the killer of three printers. The story is infused with the working class radicalism of the times & Charles Neesom, Peter Murray McDouall & Julian Harney - all real Chartists - feature prominently. For all those with an interest in Chartism, it really is worth keeping an eye on Mark Crail's Chartist Ancestors website. His latest scoop is new biographical information drawn from recently-discovered letters and - fantastic news this - a photograph of the female Chartist lecturer Susanna Inge. Not only that but a new photograph of the pioneering historian of Chartism Mark Hovell - who died exactly 100 years ago - is also displayed. An event to mark the Hovell anniversary takes place at the People's History Museum, Manchester, on 9 June 2016. Chartism Day - now marking its 21st anniversary - takes place this year at the University of Chester on 11 June 2016. NEW IMAGE OF THE BULL RING RIOTS, 1839. The Times Literary Supplement, 27 November 2015, reproduces an unpublished sketch of the Bull Ring riots, unearthed in the Library of Congress by Ian Haywood. What adds to the interest of this depiction is that it is by the famous Punch cartoonist John Doyle. This image will be appearing in a new collection of contemporary illustrations of the movement being assembled by Ian Haywood and Stephen Roberts. New article: Leonard Smith, The Working Man's Champion: Reverend Humphrey Price 1775-1853 in Midland History, vol. 40. no. 2, 2015 (Price was an Staffordshire Anglican parson who publicly lent support to the struggle for working class political rights). Malcolm Chase, The Chartists: Perspectives and Legacies is now out from Merlin. The twelve essays cover such topics as the Land Plan, Chartism in Wales, Chartist involvement in parliamentary elections, 1848 and the historiography of the movement. These collected essays confirm the very significant contribution made by Chase to the study of Chartism, which he, so very aptly, describes as Britain's civil rights movement. Dorothy Thompson was the pre-eminent historian of Chartism. Her work entirely re-shaped the way we see the movement. This collection brings together sixteen essays and reviews written by Thompson between 1952 and 2007. Of particular interest is a previously-unpublished and lengthy essay on Halifax Chartism, written in collaboration with her husband E.P. Thompson. The essays are preceded by a biographical introduction by Thompson's one-time student, Stephen Roberts. A very welcome new edition of James Epstein's The Lion of Freedom: Feargus O'Connor and the Chartist Movement 1832-1842. A brief new preface has been written for the re-publication of this magisterial book. BILLY BRAGG WRITES SONG ABOUT WILLIAM CUFFAY! Billy Bragg is currently in Tasmania, contributing to a programme to be broadcast later this year about Chartists, Fenians and others who were transported to Van Diemen's Land. As part of his contribution to this programme, Bragg has written a song about the would-be Chartist insurrectionist William Cuffay, who was transported in 1848. A programme and a song to look forward to! A second edition of A CITY OF LIGHT: SOCIALISM, CHARTISM AND CO-OPERATION - NOTTINGHAM 1844 has just been released by its author Christopher Richardson, price £7.99. Richardson has selected one key year as the focus for discussing the activities of Owenites and Chartists in this radical town. It is a well-researched book, drawing extensively on local and radical newspapers. It serves as a reminder, as we are told in the foreword by Stephen Yeo, that there are better values than the ones which dominate our lives in these individualistic times. Remembering Dorothy and Edward. A Talk by Sheila Rowbotham has just been published. Contact Past Pixels, P.O. Box 798, Worcester WR4 4BW. These reflections on Edward and Dorothy Thompson by the distinguished historian Sheila Rowbotham get to the heart of why they so profoundly influenced those they taught or who came into contact with them. Sheila first met Dorothy and Edward after being sent to meet them whilst an undergraduate by her Oxford tutor, and this portrait of them, delivered to an audience in Worcester in summer 2012, is both affectionate and insightful. Helen Macfarlane: Red Republican, edited by David Black, is released by Unkant Publishers in September 2014. Macfarlane translated the Communist Manifesto into English & contributed to the late-Chartist journals the Democratic Review (1849-50), the Red Republican (1850) & the Friend of the People (1850-1). Black's book usefully gathers together selections of Macfarlane's journalism. George Julian Harney: The Chartists Were Right, a fascinating collection of GJH's late journalism edited by David Goodway, is just out from the Merlin Press. Reform Acts: Chartism, Social Agency and the Victorian Novel, 1832-1867 by Chris R. Vanden Bossche has recently been released by John Hopkins University Press. As the title suggests, the book is the latest look at Chartism from a literary angle & draw on novels by the well-known (Dickens, Disraeli etc) as well as by the Chartists themselves (Thomas Martin Wheeler). See TLS, 20 June 2014 for a review. BBC Radio 4, 'Voices from our Industrial Past', 30 April 2014, 11am, is an investigation into the world of nineteenth century working class autobiographies. The programme includes a discussion between Emma Griffin and Stephen Roberts on the subject of the Shropshire Chartist Emanuel Lovekin. The conference takes place on Saturday 26 July 2014 from 11am-4pm & is free, but places are limited. The organizers are Westminster City Archives and the University of Roehampton. 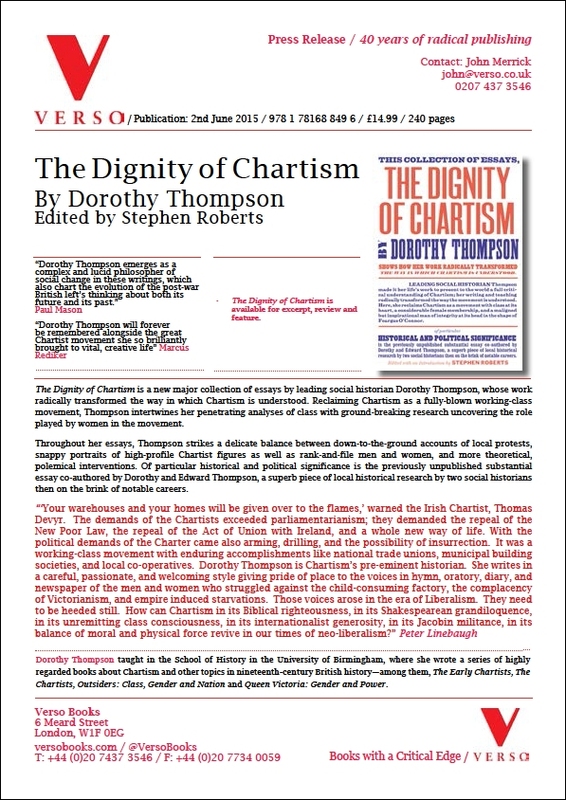 The Dignity of Chartism: Essays by Dorothy Thompson, edited by Stephen Roberts, will be released by Verso in spring 2015. Dr. J.A. Langford (1823-1903): A Self-Taught Working Man and the Sale of American Degrees in Victorian Britain by Stephen Roberts can be ordered from Amazon and other booksellers. Langford was one of a number of men who were secured LL.D degrees by payment from Tusculum College in the United States in the 1860s and 1870s. There was some controversy about this matter in the columns of British newspapers, with claims being made that Tusculum could not be found on the map. Tusculum College in fact did exist, and after the devastation of the Civil War, began to raise funds by selling degrees overseas to men deemed worthy of them. This pamphlet tells the story of this extraordinary saga. Langford's life as a poet, local historian, and radical politician is also explored in detail in the pamphlet, which draws on a recently-located cache of his correspondence. Stephen Roberts will be talking about Thomas Attwood at the Library of Birmingham on Tuesday 11 March 2014, 1pm-2pm. All welcome. An exhibition of memorabilia relating to Attwood and the Birmingham Political Union will run at the Library of Birmingham from 27 January until 27 April 2014. Ben Thompson, White Tulip, Lulu, 2013, £5, is a collection of poems written over more than forty years, and includes verse about his parents Edward and Dorothy Thompson. The actor Michael Sheen has joined in the growing chorus of criticism of the destruction - which had not been announced - of the famous mural in Newport depicting the Chartist rising of 1839. Sheen - who was born in Newport - took out a full page advert in the South Wales Argus, 18 October 2013, to condemn the demolition. The tearing-down of the mural, he wrote was 'tragic' and the failure to save it 'brings shame upon us all'. The destruction took place in spite of a petition to save it signed by more than 4,600 people. SAVE THE NEWPORT MURAL! The 35m mural - made up of 200,000 pieces of tile and glass and designed by Kenneth Budd in 1978 - in Newport which depicts the rising of November 1839 is threatened with destruction - to make way for a shopping centre! The local council claims that it would cost too much to re-locate the mural. There are few enough physical commemorations of Chartism in Britain, and it would be a sad day if this mural was to be destroyed. See the Independent 2 October 2013 and 3 October 2013 for a full report and a letter of protest from Stephen Roberts. A Save the Mural campaign has been started in Newport. Update: Sadly, the Newport Chartist mural has now been demolished. Please see four photographs of this magnificent, but now-lost, piece of public art in another section of this website. The Socialist History Society have just released The Real History of Chartism; or Eight Fallacies about the Chartist Movement by David Goodway which seeks to correct some of the common misconceptions about Chartism. Based on a lecture given at the Bishopsgate Institute, this is a very readable pamphlet by a scholar whose magisterial study of London Chartism (1982) made a significant contribution to our understanding of the movement. A CHARTIST GRAVE LOCATED: Buried in a public guinea grave in Key Hill cemetery in Birmingham is JOHN FREARSON (1811-88). A Chartist bookseller and speaker in Manchester, he later re-located to Birmingham, appearing on platforms with such leading figures as Thomas Clark, Joseph Linney and Samuel Cook (Northern Star, 1 April 1848). He became a fastenings-maker, and established the Birmingham Saturday half-holiday before, in later life, running a temperance hotel with his wife. Frearson was interested in radical ideas all his life: he knew Robert Owen and, in the 1860s, contributed to the Co-operator and, in the 1880s, corresponded with H. Halliday Sparling and Edward Aveling about William Morris' Commonweal. The story of a Chartist forgotten even by the historians of Chartism is being written up by John Frearson, who is not related to his subject. The Chartists Were Right, an anthology of the late journalism of George Julian Harney edited by David Goodway, will be going to press in the next few months. Judging by the selections Goodway drew attention to at the Sheffield Chartism Day it should be a fascinating collection. The Home Office & the Chartists 1838-48 by Neil Pye has just been released by Merlin. This thoroughly-researched & clearly written book focuses on that bastion of Chartist activity, the West Riding. Liberty's Dawn. A People's History of the Industrial Revolution by Emma Griffin contains a chapter looking at the Chartists & other radicals. Though somewhat controversial in its claims about the benefits that the Industrial Revolution brought working people, it is an immensely readable book & certainly infused with sympathy for the underdog. Thomas Attwood, MP for Birmingham, presented the first Chartist petition, signed by 1.3 million working people, to House of Commons in July 1839. The ways in which Attwood is commemorated in Birmingham is the subject of a letter by Stephen Roberts in Literary Review, June 2013. Chartism Day 2013 takes place in Sheffield. The event takes place on Saturday 29 June from 10am until 4.30pm in St. Mary's Church, Bramall Lane. It was in Sheffield, in January 1840, that the Chartists attempted a rising; the leader of that rising Samuel Holberry is buried in the General Cemetery: his headstone still stands. The evening before Chartism Day Professor Paul Pickering will give a lecture entitled 'Telling the People's Story' at Sheffield Hallam University (Friday 28 June, 6pm). A new edition of Images of Chartism: Together with Professor Ian Haywood of Roehampton University, I am planning to bring out a second edition of the collection of contemporary illustrations of the Chartist movement that I co-edited with Dorothy Thompson in 1998. We have located a number of new illustrations, but would welcome information about other pictures that did not appear in the original book. Chartism Day 2013 is scheduled for 29 June in Sheffield ... and the venue is likely to be a church where the Chartists once staged a sit-in! Matthew Roberts of Sheffield Hallam University is organising the event. A collection of Dorothy Thompson's writings on Chartism, including a major unpublished essay, is currently being put together by Stephen Roberts and is expected to be released by Verso Books in autumn 2014. Chartism Day 2012, held in the splendid surroundings of the People's History Museum in Manchester on 14 July, turned into a wonderful celebration of the Chartists. As well as papers from scholars who are well known in the field and PhD students, the event was begun and concluded by the singing of a selection of Chartist songs. For the old lags of Chartist studies, this was a potent and moving experience. Corista, five singers from Hebden Bridge, performed with real feeling a selection of Chartist hymns by such figures as Thomas Cooper and Ernest Jones as the Chartists themselves would have sung them - their website is very much worth visiting. Later in the day Canon Garth Hewitt, armed with his acoustic guitar, sang a number of songs from the Chartist era which he had set to his own music. It was a superb performance, strangely reminiscent of Cat Stevens in the early 1970s. Hewitt plans to release a CD of these songs next year. The People's History Museum has a number of fascinating Chartist items on display - including an NCA mug, a ballot box, an Ernest Jones jug and a number of images. The event was organised by Mike Sanders of the University of Manchester, who not only booked the venue and invited the speakers and singers but also ensured there were more than enough sandwiches to go round! George Jacob Holyoake's Journey of 1842 by Catherine Howe, which has just been released by History into Print of Studley, Warwickshire at £14.95, is a very enjoyable account of the early life of this profoundly interesting radical. A study by Neil Pye on how the Home Office responded to the Chartists is expected from Merlin later this year. You can hear a Chartist song performed by an eighteen year old female student on the front page of this website. Plaudits for Gemma's performance have been coming in from around the world! PORTRAIT OF ARTHUR O'NEILL LOCATED! The Chartist pastor and pacifist Arthur O'Neill was presented with his portrait at a public meeting at the town hall in Birmingham in November 1885. This oil painting by Jonathan Pratt was believed to be missing. It has, however, recently been discovered deep in the stores of Birmingham Museum & Art Gallery. It is a huge painting in a damaged frame, and has not been seen in public for almost a century. O'Neill sits in the black & white of a dissenting minister holding in his right hand a document entitled 'The People's Charter'. It is an excellent likeness & shows the pride O'Neill felt at his involvement forty years earlier in the struggle to get a say in law-making for working men. Chartism Day 2011 took place in the magnificent surroundings of the Brotherton Library at the University of Leeds on Saturday 1 July. Malcolm Chase, who organised this year's event, arranged for items from the University's Special Collections to be put on display, amongst them several most interesting letters relating to the strikes of summer 1842. The morning session focused on local studies: SEAN CREIGHTON & PAUL FANTOM have trawled through local newspaper material relating to Wandsworth in south London & Wednesbury in the Black Country, two of the smaller centres of Chartist support but nonetheless with interesting stories to be told. One of the great things about these events is that they provide social historians & English Literature scholars with an opportunity to share ideas about Chartism. Two edudite papers at the start of the afternoon from SIMON RENNIE & NICHI McCAWLEY drew attention to Shelley's influence on Chartist poetry. If the shortage of sandwiches at lunchtime had caused consternation for some members of the audience, these were soon forgotten as JANETTE MARTIN spoke about political lecturing in the Chartist era. This fascinating paper drew on deep scholarship & was delivered with great humour... Martin is clearly a young historian to watch! The day concluded with a lively discussion on the legacy of Dorothy Thompson, who died in January. The life in Australia of the transported black Chartist William Cuffay was told in the Morning Star, 1 June 2011. The author Mark Gregory has uncovered a lot of fascinating material in Australian newspapers. 'A LIFE OF DISSENT': DOROTHY THOMPSON, 1923-2011. Lecture room 1, Arts Building, University of Birmingham, Thursday 2 June, 5.30-7.15. A showing of the Channel 4 documentary on Dorothy & Edward Thompson with additional contributions from Owen Ashton, Bob Fyson, Nev Kirk & Stephen Roberts. Further information from Stephen Roberts - see contact details. A tribute to Dorothy Thompson can be found at http://www.youtube.com/watch?v=uVxbkw6BOu0. The accompanying piece of music was written by Woolly Wolstenholme, a songwriter of largely unrecognised talent, who sadly also died recently. Dorothy Thompson died on Saturday 29 January in hospital in Worcester. She was 87 years old. Dorothy was the doyen of Chartist studies. She spent the greater part of her academic career writing about the movement, and helping others to do so.No one who had contact with her will forget her willingness to give up time to talk - first at Wick Episopi and later at Rainbow Hill - and her generosity in terms of sharing ideas and lending books. It can fairly be said that she created a Thompson school - her many postgraduate students became scholars who wrote about Chartism with sympathy but also based their conclusions on solid research and careful thought. As Owen Ashton, one of her former students commented, it is 'the end of an era'. Stephen Roberts has written an essay for the History of Parliament Trust on T.S. Duncombe, the MP who championed the Chartist cause in the House of Commons. The essay on Feargus O'Connor, elected Chartist MP for Nottingham in 1847, is being written by Malcolm Chase. Both essays will be published on-line and in The Commons 1832-1868 (Cambridge University Press). A photograph of the National Chartist Hymn Book (1845), discovered by Mike Sanders of the University of Manchester in Todmorden Public Library, can be found in the Times Literary Supplement, 6 January 2011. The slim volume, with the boards of a cigar box glued to its covers, includes the lines: 'Men of England, ye are slaves/Beaten by policemen's staves'. This is a truly fantastic discovery. W.Hamish Fraser Chartism in Scotland (Merlin, 2010) has just been published. I have recently purchased two of Thomas Cooper's letters, dated November 1880 & May 1883 & concerning his lecturing arrangements, from Julian Browning Ltd. The going rate for a one page TC letter? £40 - but worth every penny! This dealer also has for sale material by other working class writers, including John Critchley Prince (manuscript entitled 'Rambles of a Rhymster', £450), Thomas Miller (a letter dated 1843, £85), Spencer T. Hall (a letter dated 1848, £100). RADIO 4 DOCUMENTARY: William Cuffay, the only black person to become a prominent figure in the Chartist Movement, is the subject of a new Radio 4 documentary on Wednesday 28 July at 11am. The son of a former slave, Cuffay was transported to Australia in 1848. Produced by Philip Sellars, the programme is presented by former trade union leader Bill Morris and features contributions from Malcolm Chase (University of Leeds) and Stephen Roberts (University of Birmingham). Colonel Charles Sibthorp, the subject of a forthcoming book by Mark Acton & Stephen Roberts, rather surprisingly made it into the pages of the best-selling music magazine The Word in May 2010. Unfortunately the rather splendid story they told about him was untrue; see issue for June 2010 for a letter from Roberts pointing this out & rather shamelessly plugging the new book. Professor David Nash (Oxford Brookes University) discusses each of the six points of the People's Charter in History Today, May 2010. The piece is easy to read, but doesn't really have anything new to say. The much-loved historian of Chartism ROBERT FYSON is 70 years old on 28 March 2010. Though he has always chosen to write about whatever takes his fancy - his most recent publication is a biography of the Manx politician and scholar A.W. Moore - his most important work has been on Chartism in the Potteries. Having made the Potteries his home - he arrived in the area to teach at what is now Staffordshire University - Bob began his research into the lives and political campaigns of the working people who lived there in the nineteenth century. The outcome has been a series of quite outstanding essays - meticulously-researched, beautifully-written and deeply sympathetic. Bob's essays on 'Daddy' Richards or William Ellis are quite simply as good as anything written on Chartism. Bob has done a great deal for the causes he believes in - championing peace and social justice as a CND activist or as an independent parliamentary candidate. His other activities and interests, as well as his desire simply to think, have resulted in his academic projects often taking longer than expected to complete. If this has sometimes frustrated colleagues, no one who has worked with Bob can be anything other than deeply impressed by his scholarship and deeply fond of the man himself. Bob now divides his time between his book-lined flat in the Potteries and the home of his partner, Valerie, in the Isle of Man. On the week-end of his birthday his many friends will be travelling from across Britain to the Potteries to raise a glass to this lovely old radical. Hamish Fraser's book on Scottish Chartism is due from Merlin next summer. BBC History Magazine (August 2009) carries a most interesting few pages on Chartism. The feature consists of large colour photographs, with annotations, of places associated with the movement - including Blackstone Edge in Lancashire, the scene of many great meetings, the Chartist cottage in Dodford, Worcestershire, and Kennington Common. 'A wonderful book' - Tony Benn on The Chartist Prisoners by Stephen Roberts. The book can be ordered from the website of the publisher, Peter Lang. Billy Bragg & Martyn Joseph performed in a 'Songs of Protest' concert at the Grand Pavilion, Porthcawl, in June to help usher in commemorations of the Chartist Rising of November 1839. A fantastic array of other activities - lectures, musical performances, walks, coach tours - has been arranged across South Wales for the rest of the year. You can find full details at www.newport.ac.uk/chartist. The events involve scholars of Chartism, local school pupils & male voice choirs. A considerable amount of work has gone into organising these events ... a lot of people clearly feel that the Chartists deserve to be remembered. Mark Acton (Lincolnshire Archaeological & Historical Society) & Stephen Roberts have signed a contract for a book on that scourge of Chartism, Colonel Sibthorp. The book is scheduled for publication in summer 2011. Edward Vallance's A Radical History of Britain (Little, Brown 2009) devotes 100 pages to Chartism. Vallance makes use of recent research on the movement & provides a reliable, readable & sympathetic account of the movement. Stephen Roberts is now working on a short book about arch-Tory MP Colonel Charles Sibthorp, who objected to reform, railways & the Great Exhibition and who, to his great horror, found himself a signatory of the great Chartist petition of 1848! This year's meeting of Chartist enthusiasts takes place at Llanidloes, mid-Wales, on Saturday 16 May. Owen Ashton, Malcolm Chase & Joe England will be giving papers on suitably Welsh topics. More from o.ashton@tiscali.co.uk. March 2009: Michael Sanders' new study of the poetry column of the famous Chartist newspaper the Northern Star is just out from Cambridge University Press. The Poetry of Chartism costs £50. Those interested in Chartist verse should also see Tim Randall's excellent contribution to Ashton, Fyson & Roberts eds. The Chartist Legacy (1999). The Dictionary of Nineteenth Century Journalism, edited by Laurel Brake and Marysa Demoor, was published by the British Library in January 2009. It contains 1700 entries, with contributions on the major Chartist periodicals and Chartist journalists from Joan Allen, Owen Ashton, Malcolm Chase, W. Hamish Fraser, Paul Pickering and Stephen Roberts. The editors should be congratulated on this splendid volume. Anyone interested in Chartism and radicalism would enjoy a visit to an exhibition at the British Library entitled Taking Liberties. The exhibition, which continues until 1 March 2009, includes several Chartist-related items, amongst them a huge reproduction of the famous photograph of the demonstration of 10 April 1848 & a copy of Thomas Cooper's Purgatory of Suicides. There is an interesting essay on the exhibition by David Horspool in the TLS 16 i 09. This includes a mention of Thomas Cooper, surely making him the Chartist who crops up in that august publication most often - Cooper would have been delighted! The special issue of Labour History Review devoted to Chartism is now due in March 2009. Professor Owen Ashton will be talking in Newport about the Chartist uprising of 1839 on 1 November 2008; other events commemorating this famous event will be taking place in the town around the same time. Twenty-five people attended the launch of The Chartist Prisoners by Stephen Roberts at the Birmingham & Midland Institute on Saturday 13 September. Dorothy Thompson introduced the event by commenting on the significance of Chartism & Stephen Roberts then spoke about the Chartist prisoners, Cooper & O'Neill. A lively discussion followed. The following day, Sunday 14 September, Stephen Roberts was interviewed about the Chartists & his new book by Professor Carl Chinn on Radio WM. Stephen Roberts' The Chartist Prisoners can now be ordered from the website of the publisher, Peter Lang. Alternatively a bookshop should be able to obtain the book for you - quote the ISBN 978-3-03911-388-0pb as well as the publisher, author & title. The Chartist Prisoners tells the stories of Thomas Cooper & Arthur O'Neill. Imprisoned in 1843, these two Chartist leaders formed a friendship which lasted for fifty years. These two men led very busy lives. Cooper wrote novels & poetry, getting to know Carlyle & Dickens well, & became a Christian lecturer. O'Neill became a tireless campaigner for peace & international arbitration. The book will be launched in the suitably Victorian surroundings of the Birmingham & Midland Instutute on Saturday 13 September at 2pm. Dorothy Thompson will introduce Stephen Roberts. And, on Radio WM at 2pm on Sunday 14 September, Stephen Roberts will be discussing the book with Carl Chinn. A play about the Chartists entitled 'Unfinished Business' will be performed at the Stand Up For Your Rights Festival at Waterloo Action Centre, 14 Bayliss Road, London SE1 7AA on 18 October 2008. Politicians eg John McDonnell MP & academics eg Prof. Bill Bowring will be present at what looks like being a lively event. More info: info@aworldtowin.net or 07871 745258. There is much of interest to historians of Chartism in a new volume on G.W.M. Reynolds edited by Ann Humphreys & Louis James. Contributors include Chartist stalwarts Rohan McWilliam & Tony Taylor. Chartism Day 2008 took place in that most appropriate of all Chartist locations: Newport. As we will see memories of the 1839 Newport Rising were never far away. Around 40 people attended. Janette Martin (a PhD student at the University of York) commenced the conference with a remarkable paper on Chartist rhetoric. Exploring the performative aspects of the Chartist lecture, she paid attention not only to the different forms of langauge but also the new speaking styles of the 1840s. Fabrice Bensimon (University of Paris 10) then presented a paper which made us think about Chartist internationalism in new ways. He revealed how migrant workers promoted Chartism, particularly the Land Plan, in France. Next Rohan McWilliam (Anglia Ruskin University) examined the impact of the popular French author Eugene Sue on the Chartist novelist, G.M.W. Reynolds. Finally Kate Bowen & Paul Pickering (both Australian National University) talked about their exciting project on Chartist songs. Pickering (an historian) & Bowen (a musicologist) reconstructed songs as they were sung at Chartist meetings & discussed the songs in ways never attempted before. The conference made the most of its location. Les James led participants on a walk that took in St. Woolos Church, where the Chartists killed in 1839 were buried, the Westgate Hotel, where the shootings took place, & the Chartist mural (sadly soon to be demolished). Paul Flynn MP greeted participants in the conference at a civic reception at Newport Library in the evening. On Sunday Les James vividly re-created the routes taken by the Chartists on their way to Newport. Paul Pickering's biography of Feargus O'Connor is just out from Merlin. A review appears elsewhere on this website. A Chartist volume of Labour History Review is due either later in 2008 or early 2009. The Dictionary of Nineteenth Century Journalism will be published in October 2008. There are plans for a launch at the British Library. It includes numerous entries relating to Chartism. Joan Allen's biography of the famous north-east radical Joseph Cowen is now out from Merlin Press. Chartism Day 2008 takes place on Saturday & Sunday 7 & 8 June in Newport. There will be five speakers. Programmes will be sent out soon; for further info. please contact Prof. Owen Ashton at o.ashton@tiscali.co.uk. Dorothy Thompson informs me that the fragment of a working class petition deposited in the Working Class Movement Library in Salford is now thought to be no later than 1842 (See Ashton, Fyson & Roberts eds., The Chartist Movement, item 83). This means that it is probably either part of the national petition of 1839 or of the petitions of early 1840 calling for the commutation of the death sentences passed on the leaders of the Newport Rising. Early Victorian MPs Edward Horsham & James Bradshaw may not be familiar names to the historians of Chartism ... but they should not be forgotten. They fought a duel at Wormwood Scrubs when Horsham accused Bradshaw of being a republican & Chartist! Neither was seriously injured ... not many people know that! In December 2007 100 people attended A People's History of the West Midlands Conference in Birmingham. Stephen Roberts spoke about Arthur O'Neill & Birmingham Chartism & there were also papers on the anti-slavery movement & the chain makers of Cradley Heath. Robert Hall's book is now available from all good bookshops! Robert G. Hall's Voices of the People - a study rooted in detailed work on Chartism in Ashton-under-Lyne - is due from Merlin Press any day now (Sept. 2007). Next year will see the publication by Merlin of Paul Pickering's biography of Feargus O'Connor. Pickering tells the story as a tragedy - his book will undoubtedly be a major event in Chartist historiography. 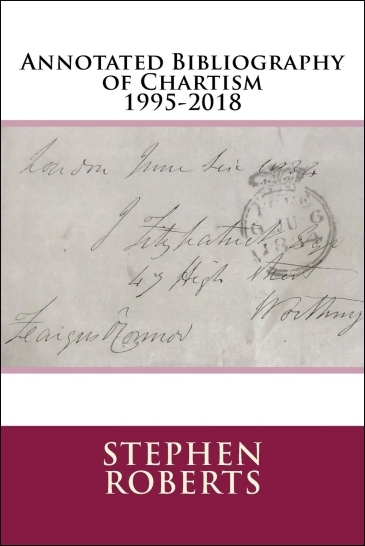 Stephen Roberts' new book, The Chartist Prisoners: The Radical Lives of Thomas Cooper (1805-92) and Arthur O'Neill (1819-96) will be published by Peter Lang in summer 2008. Thomas Slingsby Duncombe, the defender of the Chartists in Parliament, is at last getting a scholarly biography. Radical Dandy: The Curiously Forgotten Political Life of Thomas Slingsby Duncombe by Prof. Stephen Duncombe of New York University will be published by the University of California Press. Braving inclement weather, 29 hardy souls managed to get themselves to the twelth annual conference on Chartism, held in 2007 at the University of Sheffield. There were papers on the links between the radicals of 1817 & the Chartists, the Newport Rising, the appeal of the democratic ideas of Chartism & Bronterre O'Brien. Next year's event is scheduled for Newport. Ariane Schnepf has written a new study of Chartist language. Our Original Rights as a People is published by Peter Lang at £36.10. The Globe Theatre in London will be presenting a play about Chartism in summer 2007. Called 'Holding Fire', it has been written by the actor/director/playwright, Jack Shepherd. It will be interesting to see how O'Connor and the other leaders of the movement are portrayed on stage. A forthcoming issue of the theatre's magazine 'Around the Globe' will carry a piece on Chartism by Stephen Roberts. A copy of Thomas Cooper's Purgatory of Suicides owned by his wife, Susanna, has surfaced in New Zealand! The volume has many manuscript corrections, additions and deletions in Cooper's hand. This book could be yours - for £300. My own copy of a first edition of the poem, inscribed by Cooper to an old friend, cost £175. Mike Sanders is continuing with his work on Chartist poetry at the University of Manchester. His examination of the Northern Star's editorial policy with regard to the poetry column appeared recently in Victorian Periodicals Review and a fresh look at the poetry of Gerald Massey should be published in Victorian Poetry in the not too distant future. A monograph is also in the final stages of preparation. Over 40 people attended Chartism Day at the University of Chester on 17 June. Papers were given on Lovett & O'Connor (Malcolm Chase), Christianity in Chartist Poetry (Roy Vickers), Chartism & the Miners (John Flanagan) & Chartism & Radical Memory of Peasant Revolt (Antony Taylor). The event moves to Sheffield next year. More from the indefatigable Owen Ashton at Staffordshire University. W. Hamish Fraser's study of the flamboyant would-be insurrectionist, John Taylor, has just been published by the Ayrshire Archaeological and Natural History Society. It costs only £4 and is available from Ronald W. Brash, 10 Robsland Avenue, Ayr KA7 2RW. See reviews section. Stephen Roberts' new book length study is entitled "The Chartist Prisoners". It tells the stories of Thomas Cooper and Arthur O'Neill, whose life-long friendship began in Stafford Gaol in 1843. Publication is expected in 2009. The Radio 3 Programme "Nightwaves" recently visited Dodford. Gordon Long and Stephen Roberts contributed to a report broadcast on 20 March. The Chartist cottage at Dodford will be open for pre-booked tours on Sundays from April to September. To book contact Hanbury Hall on 01527 821214. The Ten Greatest Chartists ... Ever! Malcolm Chase's Chartism : A New History is expected from Manchester University Press in 2007. This will be the first narrative account of the movement since that of J.T. Ward over thirty years ago. Keith Flett's volume on the immediate post - Chartist period is due from Merlin in April 2006. Other Chartist figures might have received more attention than O’Brien, but he has a claim to be regarded, in his heyday, as the most interesting and dynamic of the movement’s leaders. What follows is a study of leadership viewed through the prism of reputation—for if leaders were really to lead, and exert influence beyond their immediate location and personal circle, they had to build and use reputation.